Thanks to Norma Gail for inviting me to participate in the My Writing Process Blog Tour. Norma is a women’s Bible study leader, blogger, and author. She is a member of American Christian Fiction Writer’s, Faithwriter’s, and the New Mexico Christian Novelists. Her debut novel, Land of My Dreams, is published by Lighthouse Publishing of the Carolinas and is available from Amazon. It tells the story of an American college professor and a Scottish sheep farmer who must learn to leave loss and doubt behind in order to find lasting love and renewed faith in God. Sirius XM Humorist, Amazon “Best-Selling” author and award-winning professional singer, Jane Jenkins Herlong, CSP finds the funny in dysfunction while entertaining with her comedy laced with Biblical truths and singing heard on Sirius XM Satellite Radio and Pandora. Jane helps audiences confront negativity with grace and humor to increase performance and productivity as she did overcoming being labeled Dyslexic and other challenges. 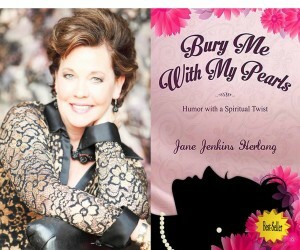 From the tomato fields of Johns Island, South Carolina to a Miss America runway and beyond, Jane’s funny original, Southern stories and award-winning singing helps audiences learn life-skills and the healing power of laughter when dealing with stressful issues thrown at their field of dreams. You will love this farm-girl’s Southern-style recipe for balancing your own personal journey with a sense of humor, hope and heaping helping of folksy wisdom.